EXECUTIVE SUMMARY: While matters pertaining to Israel’s purchase of German submarines are central to the corruption case involving former senior Israeli officials and officers, the subs themselves are very important to the Jewish state’s military security. As dangerous enemies arm themselves with missiles that can strike anywhere, the strategic value of a submarine fleet continues to rise. A long-running criminal investigation by Israel Police – dubbed Case 3000 – against former senior Israeli officials and officers, some of whom are members of PM Netanyahu’s coterie, hit the headlines in November. It is the most significant corruption scandal ever to affect the sensitive field of defense acquisitions. After a lengthy investigation, the Israel Police recommended that 12 people, including Netanyahu’s personal attorney, stand trial for corruption-related charges. The alleged offenses occurred during contacts between German shipbuilders Thyssenkrupp and the Israeli government for the purchase of a sixth Dolphin-class submarine, as well as four German-made Sa’ar 6-class missile ships designed to protect Israel’s gas-drilling rigs in the Mediterranean Sea. The investigation also touched on talks that centered around a planned future acquisition of three more submarines from Thyssenkrupp. Those subs are intended to replace the first three 1990s-era Dolphin submarines in Israel’s fleet. The media and political firestorm that followed the announcement by the police included questions about the nature of the naval platforms that Israel is looking to buy, with some commentators casting doubt on whether Israel needs a fleet of six submarines. A submarine is the most expensive platform an army can buy, significantly surpassing the costs of other advanced platforms, such as fighter jets. Submarines’ ability to move invisibly means they can be used covertly to gather intelligence on enemy activities, approach enemy coastlines, and strike targets with precision missiles of the standoff strike variety and with long-range torpedoes. According to international media reports, they are also a key aspect of Israel’s nuclear deterrent and second-strike capability. According to Professor Rear Admiral (Res.) Shaul Chorev, head of the Haifa Research Center for Maritime and Policy Strategy at the University of Haifa, the platforms in question represent the cutting-edge capabilities of naval warfare and will serve Israel’s defense needs long into the future. Chorev, a former Israel Navy Submarine Flotilla commander and the first project manager of Dolphin submarines at German shipyards, drew a line between the ethical questions exposed by the investigation, which he said ought to be addressed, and Israel’s genuine need for the submarines. “No one with the submarine insignia [on his uniform] was involved with this,” he stressed. Chorev argued that in light of the growing threats to surface Navy vessels, especially near coastlines and in asymmetric warfare, submarines, with their underwater stealth capability, are turning into the modern-day elite force. Modern naval powers around the world are increasingly relying on them to conduct roles once reserved for surface naval ships like cruisers and destroyers. Chorev, a former deputy chief of naval operations and ex-commanding officer of the Haifa Naval Base, traced the deep roots of Israeli-German cooperation on submarine purchases. Israel, he said, began thinking about buying Dolphin submarines as far back as 1980. For many years, the only real question among those determined to expand Israel’s fleet was whether the Navy should acquire five or six submarines. “Even in the 1950s, Yosele Dror [the first commander of Israel’s submarine flotilla] talked about six submarines,” Chorev recalled, speaking in his office at the University of Haifa. Additionally, he said, there has traditionally been a big gap between the view held by prime ministers and several defense ministers, who grasped the strategic importance of submarines, and the view of Chiefs of Staff and the General Staff. The latter often grappled with urgent budget needs and immediate demands, factors that caused them to resist expanding the fleet. Back in 1960, PM David Ben-Gurion met with Germany’s Chancellor Konrad Adenauer at the Waldorf Astoria Hotel in New York and requested an agreement to purchase advanced German submarines for the Israeli Navy. At that time, Israel had three Gal-type British-made submarines, which were manufactured at the start of the 1970s and began arriving in Israel in the mid-1970s. In 1983, after a series of successful submarine operations, officers from inside the Navy, led by Navy Chief Adm. Ze’ev Almog, began lobbying the Chief of Staff at the time, Lt. Gen. Rafael Eitan, to buy a fourth submarine. “Raful [Eitan’s nickname] simply said: ‘Fine, go and buy it,’” recalled Chorev, who commanded the submarine flotilla at the time. That year, Chorev joined a Ministry of Defense delegation. The group visited a German shipyard, but it rejected the Israeli request to buy submarines due to political obstacles. The delegation then traveled to the US, where it visited the Quincy shipyards south of Boston. There, they met with a willingness to build submarines for Israel, but the shipyard ran into resistance from the US Navy. By that point, the US Navy was based entirely on nuclear-powered submarines, and it was concerned that production of diesel-powered submarines – which is what Israel was seeking – would result in pressure on the US to vary its fleet. The delegation returned to Israel with a signed contract for Sa’ar 5 missile ships but not for a fourth submarine. The delegation recommended that Israel focus on kick-starting the Dolphin project as Israel had already mapped out that future vessel’s requirements. In 1987, a committee of experts advised that Israel purchase two Dolphin submarines from German shipyards. In 1990, the possibility of purchasing submarines from Germany surfaced once again after a new ruling party took power in Germany. The proposal faced resistance from the deputy Chief of Staff at the time, Ehud Barak, who cited the lack of air-force squadrons and rising tensions with Iraq to the east. He demanded to know why $360 million of American military assistance funds should go to submarines at such a time. Moshe Arens, the defense minister at the time, simply said: “I will decide on this later,” recalled Chorev. Arens decided to purchase two German-made Dolphin submarines and reserve an option for a third, and a contract was signed. But on Nov. 30, 1990, Israel –concerned about the need to divert funds to deal with the military threat from Iraq – canceled the contract. It was the last day on which cancellation was possible. When the 1991 Gulf War broke out, Germany found itself deeply embarrassed by the fact that Iraqi missiles, developed with the aid of German companies, were raining down on Israel. “Germany’s foreign minister at that time, Hans Dietrich-Genscher, visited Israel during the Gulf War and said, ‘It is clear to me that we have to do something.’ At this stage, the defense establishment in Israel spoke clearly and told the Germans, ‘We want you to fund this project.’ The Germans contributed 850 million marks – the shame the Germans felt was so big. Chancellor Helmut Kohl accepted this arrangement,” related Chorev. A new contract was signed, and Germany funded two of Israel’s first-ever Dolphin submarines – a new type of platform that represented a generational leap forward compared to the German export version of the flagship 209 vessel type of that era. “We wanted a unique submarine that would answer all of our future naval needs,” said Chorev. The new Dolphins came with modern combat, command and control, and machine control systems. In 1992, the Chief Commander of the Israeli Navy, Ami Ayalon, decided to purchase a third submarine and ran into a wall of resistance from the IDF General Staff. But Ayalon received the backing of PM Yitzhak Rabin, who overrode the General Staff, and Israel and Germany divided the funding for the project 50/50. “The military told Ayalon, you [the Navy] are going to absorb the cost for this from your own budget. It will cost you $120 million. There was lots of anger in the Navy about this,” said Chorev. Despite these hurdles, the first Dolphin submarine arrived at Haifa base in 1999, marking the start of a new era for Israel’s naval capabilities. 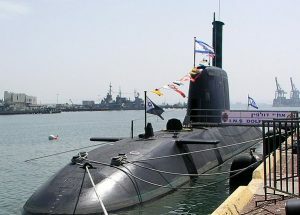 Chorev noted that as soon as Netanyahu was elected in 1996, he grasped the significance of submarines and “recognized the importance of having a fleet.” In 2002, PM Ariel Sharon set a policy of having five submarines, continuing Netanyahu’s view. “Sharon saw the need. And one of the things that stood out to him was American nuclear subs, which could cruise, stay submerged for a long period of time, and travel around the earth without needing to rise up to periscope depth. The Dolphins 1 to 3 had a weak spot: They could only remain deeply submerged for a few days before having to reach periscope depth to recharge their batteries. This limited their survivability,” explained Chorev. By this time, Germany’s HDW shipbuilders had developed a new version of their type 212-class submarines that came with Air Independent Propulsion (AIP), which generates electricity from hydrogen and water. The diesel-powered submarine used new Siemens fuel cells. “This lets the submarines remain submerged for a few more days, and is a very quiet system [evading enemy sonar detection],” said Chorev. Prime Minister Ehud Olmert, who succeeded Sharon as acting premier after Sharon’s stroke, approved the purchase of two AIP Dolphins, bringing the fleet to a total of five. He found at himself at odds with the Chief of Staff at the time, Dan Halutz, who “said there are more important things,” recalled Chorev. “Olmert said, ‘This is my decision.’” The familiar pattern of PMs overriding the General Staff on submarines repeated itself. In 2005, a new German government under Chancellor Angela Merkel had taken power, allowing the decision by Sharon and Olmert to build Israel’s fourth and fifth submarines to go ahead. This included a commitment by Germany to fund a third of the project. Netanyahu then returned to power in 2009 and called for the purchase of a sixth Dolphin submarine, clashing with the IDF over the matter. “This is the time that the corruption investigation is looking at. If you have an agreement between states, why is an agent needed? Why were agents involved? This is a good question. There is no need for agents [to act as intermediaries],” said Chorev. “But there is no connection between that and Israel’s need for a sixth submarine. Netanyahu thought we needed six submarines. A ministerial commission for acquisition approved this unanimously,” he added. “The fourth, fifth, and sixth Dolphins have technology from the early 1990s, so it is clear that the next three will be their successors. This time, we have to start from scratch, and the process of designing them will take much longer. It’s not just about inserting AIP systems,” said Chorev. At no point did Netanyahu mean for Israel to have nine submarines, he stressed. The next three submarines will replace the first three Dolphins, and they will come with new engine designs, generators, and a range of technology to replace systems that have become obsolete. “We finished the specifications of the Dolphin submarine in 1980. The first Dolphin arrived 17 years later, in 1997,” said Chorev, underlining just how long it takes to design and construct new submarines, which will serve in the Israeli Navy for the next 30 years. This means the time frame for the next generation of Dolphin submarines is tight. Israeli Naval teams continue to work closely with German shipbuilders in an effort to make sure that Israel stays ahead of its many challenges in the underwater arms race. This is an edited version of an article that was published on JNS.org on December 28, 2018.